This page mentions basics of abcd matrix and S-matrix. It mentions formula to convert abcd matrix to S-matrix and to convert S-matrix to abcd matrix. • S-matrix is composed of S-parameters or scattering parameters. • It is known as scattering matrix. • It describes electrical behavior of linear electrical networks when subjected to steady state stimuli with the help of electrical signals. • They do not use open circuit and short circuit conditions. • They use matched loads to characterize linear electrical network due to ease at higher frequencies compare to short/open circuit terminations. 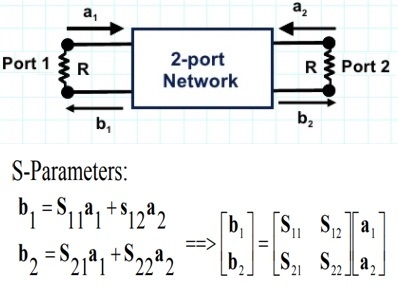 Following figure depicts 2-port network with s-parameters. A set of linear equations are written to describe network in terms of injected and transmitted waves. • Electrical circuit or network is composed of inductors, capacitors or resistors in its basic form. 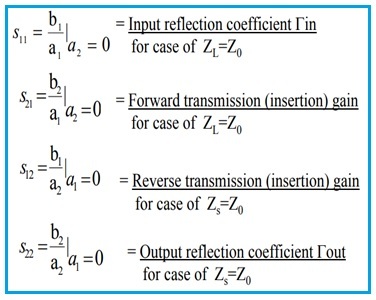 Some of their parameters such as return loss, insertion loss, gain, VSWR, reflection coefficients are represented by S-parameters. • S-parameters are similar to other parameters such as Z-parameters, Y-parameters, H-parameters, T-parameters, abcd-parameters etc. 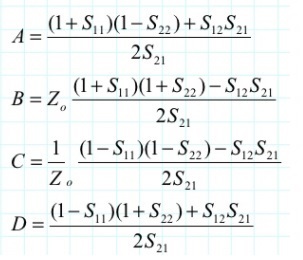 • Following equations are used to derive various S-parameters such as S11, S12, S21 and S22. Let us understand abcd-matrix before we go through conversion between S-matrix and abcd-matrix. • It describes network in terms of both voltage and current waves as shown below. • It is also known as transmission matrix. • It is suitable to cascade elements since it represents ports in terms of currents and voltages. The matrices are cascaded by multiplication operation. • Coefficients are defined using superposition as follows. • ABCD parameters are expressed as follows. S-parameters are measured using VNA. Later they are converted to ABCD matrix. 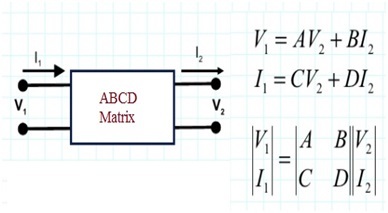 ABCD matrix can also be converted to S-matrix. 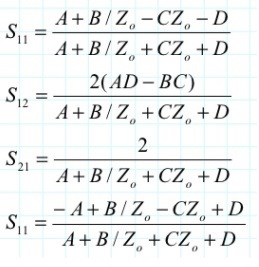 Following equations are used to convert abcd matrix to S-matrix. Following equations are used to convert S-matrix to abcd matrix.